After a couple of lousy issues of Fallen Angels and one with Simonson, I was pleased to find this ish tucked away behind the rest of the New Mutants books. Though it doesn’t have a date as to where it falls specifically, this is before the Fallen Angels hoopla and before Simonson took over. Wins on both ends. 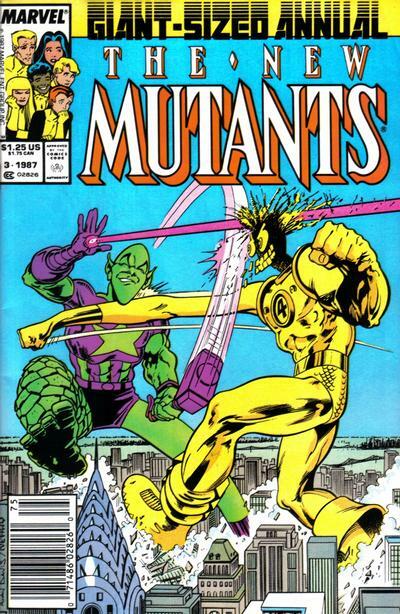 The cover isn’t much of a giveaway, though not having seen the character before this, I assumed he was a Skrull, mainly because of his shape-changing abilities and coloring. This coloring is the deus ex machina for the story’s end. We open on the kids facing off against the Teen Avengers in the Danger Room, and after a hearty battle win the day. There isn’t much time for celebration because the Impossible Man shows up. Turns out he’s looking for the X-Men, and that they’re last “battle” had the Impossible Man kidnapping the X-mansion. It’s funny that Sunspot asks if the story actually happened, making me wonder if whatever pranks played were actually part of continuity. Impossible Man wants to play, and he’s not partial to with whom he plays. Impossible Man figures the New Mutants are scared, to which Warlock takes a personal affront. After some shape-changing of his own, the two disappear. What happens through the rest of the issue are the two characters zipping around the world as characters on equal footing as they try to best each other. The New Mutants make off after them (in their graduation uniforms) to keep them out of trouble. This is harder said than done. They change into Hulk/Thing, Captain America/Captain Britain, and Magneto/Professsor X copies as they scoot all over the world. The best happens in Rio, however, where they both reform into hunks that are having a beauty contest on the beach. The New Mutants try to stop them, but every step they get in the way and make things worse for Impossible Man and Warlock, each time upping the anger of the two. Thinks make for an amusing ending in Japan, using Impossible Man’s weaknesses to win. All in all, pretty fun, especially the characters Impossible Man pulls from Marvel’s stock of heroes and villains. Reminds me a bit of Mister Mxyzptlk, only not as cool.